Like most people, I have a dirty little secret: I collect tacky souvenirs from monuments and buildings when I travel. Like collections of snow globes, one monument alone is a tasteless souvenir. But put together a FULL CITY of monuments and you make a statement. My wife could never understand this mania, or “neurosis,” as she puts it, until a few years ago when the San Francisco International Airport featured a full concourse exhibit of souvenir monuments from around the world. There, in plenty of glory, were miniature reproductions of every major edifice in the world. Suddenly, my puny collection gained stature and value, rather then just being the goofy past-time of a middle-aged traveler. Some day, I could bequeath my collection to the Museum of Modern Art or even the Met! eum asking to take my collection on tour. They will make a perfect addition to my collection of stone, plaster, bronze and wood miniatures from cities I’ve visited around the world. To read more about the history of this crazy hobby, check out this book: Souvenir Buildings Miniature Monuments: From the Collection of Ace Architects, which is a good book for dads and kids. My four-year-old son loves looking at the monuments. The book is divided mostly into major city-scapes, composed of mostly bronze and iron replicas of local landmarks and buildings. 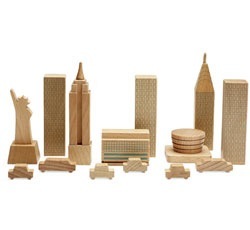 This is a fun book for both dads, kids, and budding architects.